Derechos can cause hurricane-force winds, tornadoes, heavy rains, and flash floods. In many cases, convection-induced winds take on a bow echo (backward "C") form of squall line, often forming beneath an area of diverging upper tropospheric winds troposphere, and in a region of both rich low-level moisture and both warm-air advection. Derechos move rapidly in the direction of movement of their associated storms, similar to an outflow boundary (gust front), except that the wind remains sustained for a greater period of time (often increasing in strength after onset), and may exceed hurricane-force. A derecho-producing convective system may remain active for many hours and, occasionally, over multiple days. 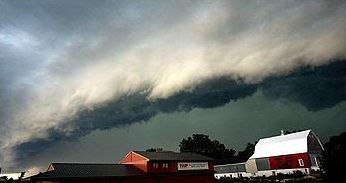 A warm-weather phenomenon, derechos occur mostly in summer, especially during June, July, and August in the Northern Hemisphere, within areas of moderately strong instability and moderately strong vertical wind shear. However, derechos may occur at any time of the year, and can occur as frequently at night as during the day. Classic derechos occur with squall lines that contain bow- or spearhead-shaped features as seen by weather radar that are known as bow echoes or spearhead echoes. Squall lines typically "bow out" due to the formation of a mesoscale high pressure system which forms within the stratiform rain area behind the initial convective line. This high pressure area is formed due to strong descending air currents behind the squall line, and could come in the form of a downburst. The size of the bow may vary, and the storms associated with the bow may die and redevelop. During the cool season within the Northern Hemisphere, derechos generally develop within a pattern of mid-tropospheric southwesterly winds, in an environment of low to moderate atmospheric instability (caused by relative warmth and moisture near ground level, with cooler air aloft, as measured by convective available potential energy), and high values of vertical wind shear (20 m/s [72 km/h; 39 kn; 45 mph]) within the lowest 5 km [16,000 feet] of the atmosphere). Serial derecho – This type of derecho is usually associated with a very deep low. Single-bow – A very large bow echo around or upwards of 400 km (250 miles) long. This type of serial derecho is less common than the multi-bow kind. An example of a single-bow serial derecho is the derecho that occurred in association with the October 2010 North American storm complex. Multi-bow – Multiple bow derechos are embedded in a large squall line typically around 400 km (250 miles) long. One example of a multi-bow serial derecho is a derecho that occurred during the 1993 Storm of the Century in Florida. Because of embedded supercells, tornadoes can spin out of these types of derechos. This is a much more common type of serial derecho than the single-bow kind. Multi-bow serial derechos can be associated with line echo wave patterns (LEWPs) on weather radar. Hybrid derecho – A derecho with characteristics of both a serial and progressive derecho. Similar to serial derechos and progressive derechos, these types of derechos are associated with a deep low, but are relatively small in size. An example is the Late-May 1998 tornado outbreak and derecho that moved through the central Northern Plains and the Southern Great Lakes on 30–31 May 1998. Derechos in North America form predominantly from April to August, peaking in frequency from May into July. During this time of year, derechos are mostly found in the Midwestern United States and the U.S. Interior Highlands most commonly from Oklahoma and across the Ohio Valley. During mid-summer when a hot and muggy air mass covers the north-central U.S., they will often develop farther north into Manitoba or Northwestern Ontario, sometimes well north of the Canada–US border. North Dakota, Minnesota, and upper Michigan are also vulnerable to derecho storms when such conditions are in place. They often occur along stationary fronts on the northern periphery of where the most intense heat and humidity bubble exists. Late-year derechos are normally confined to Texas and the Deep South, although a late-summer derecho struck upper parts of the New York State area after midnight on 7 September 1998. Warm season derechos have greater instability than their cold season counterpart, while cool season derechos have greater shear than their warm season counterpart. Unlike other thunderstorms, which typically can be heard in the distance when approaching, a derecho seems to strike suddenly. Within minutes, extremely high winds can arise, strong enough to knock over highway signs and topple large trees. These winds are accompanied by spraying rain and frequent lightning from all directions. It is dangerous to drive under these conditions, especially at night, because of blowing debris and obstructed roadways. Downed wires and widespread power outages are likely but not always a factor. A derecho moves through quickly, but can do much damage in a short time. ^ a b c Corfidi, Stephen F.; Johns, Robert H.; Evans, Jeffry S. (3 December 2013). "About Derechos". Storm Prediction Center, NCEP, NWS, NOAA Web Site. Retrieved 8 January 2014. ^ a b Corfidi, Stephen F.; Coniglio, Michael C.; Cohen, Ariel E.; Mead, Corey M. (June 2016). "A Proposed Revision to the Definition of "Derecho"". Bulletin of the American Meteorological Society. 97 (6): 935–949. Bibcode: 2016BAMS...97..935C. doi: 10.1175/BAMS-D-14-00254.1. ^ Merriam-Webster's Spanish/English Dictionary (2009). Derecho. Merriam-Webster, Incorporated. Retrieved on 2009-05-03. ^ Wolf, Ray (18 December 2009). "A Brief History of Gustavus Hinrichs, Discoverer of the Derecho". National Weather Service Central Region Headquarters. Retrieved 4 July 2012. ^ Schaefer, Joseph T. (December 1986). "Severe Thunderstorm Forecasting: A Historical Perspective". Weather and Forecasting. 1 (3): 164–189. Bibcode: 1986WtFor...1..164S. doi: 10.1175/1520-0434(1986)001<0164:STFAHP>2.0.CO;2. ^ Office of the Federal Coordinator for Meteorology (2008). "Chapter 2: Definitions" (PDF). NOAA. pp. 2–1. Archived from the original (PDF) on 6 May 2009. Retrieved 3 May 2009. ^ Parke, Peter S. and Norvan J. Larson (2005). Boundary Waters Windstorm. National Weather Service Forecast Office, Duluth, Minnesota. Retrieved on 2008-07-30. ^ Burke, Patrick C.; Schultz, David M. (2004). "A 4-Yr Climatology of Cold-Season Bow Echoes over the Continental United States". Weather and Forecasting. 19 (6): 1061–1069. Bibcode: 2004WtFor..19.1061B. doi: 10.1175/811.1. ^ a b c Ashley, Walker S.; Mote, Thomas L. (2005). "Derecho Hazards in the United States". Bulletin of the American Meteorological Society. 86 (11): 1580–1585. Bibcode: 2005BAMS...86.1577A. doi: 10.1175/BAMS-86-11-1577. ^ Coniglio, Michael C.; Stensrud, David J. (2004). "Interpreting the Climatology of Derechos". Weather and Forecasting. 19 (3): 595. Bibcode: 2004WtFor..19..595C. doi: 10.1175/1520-0434(2004)019<0595:ITCOD>2.0.CO;2. ISSN 1520-0434. ^ Storm Prediction Center (4 August 2004). "Summary of the Subtropical Derecho". National Oceanic and Atmospheric Administration. Retrieved 21 December 2010. ^ Corfidi, Stephen F. "The Utah-Wyoming derecho of May 31, 1994". Storm Prediction Center, NCEP, NWS, NOAA Web Site. Retrieved 8 January 2014. ^ a b Brandon Vincent and Ryan Ellis (Spring 2013). "Understanding a Derecho: What is it?" (PDF). Changing Skies over Central North Carolina. 10 (1): 1–7. Retrieved 6 May 2013. ^ "Derecho". XWeather.org. Retrieved 12 June 2013. ^ "What was the Largest Hurricane to Hit the United States?". Geology.com. Retrieved 12 June 2013. ^ David M. Roth. MCS with Eye - 21 July 2003. Retrieved on 2008-01-08. ^ Lima de Figueiredo, Eliton; de Lima Nascimento, Ernani; Ilha de Oliveira, Maurício (23 January 2019). "Analysis of two derecho events in Southern Brazil". Meteorology and Atmospheric Physics: 1–20. doi: 10.1007/s00703-018-0654-x (inactive 13 March 2019). ISSN 1436-5065. ^ Negrón-Juárez, Robinson I.; Chambers, Jeffrey Q.; Guimaraes, Giuliano; Zeng, Hongcheng; Raupp, Carlos F. M.; Marra, Daniel M.; Ribeiro, Gabriel H. P. M.; Saatchi, Sassan S.; et al. (2010). "Widespread Amazon forest tree mortality from a single cross-basin squall line event". Geophysical Research Letters. 37 (16): 16701. Bibcode: 2010GeoRL..3716701N. doi: 10.1029/2010GL043733. ^ Xia (夏茹娣), Rudi; et al. (2012). "An observational analysis of a derecho in South China". Acta Meteorologica Sinica. 26 (6): 773–787. doi: 10.1007/s13351-012-0608-z. ^ Janssen, Kim, Mitch Dudek and Stefano Esposito, "Storm could break ComEd record with 860,000-plus losing power," Chicago Sun-Times, 11 July 2011. ^ Simpson, Ian (30 June 2012). "Storms leave 3.4 million without power in eastern U.S." Chicago Tribune. Reuters. Retrieved 30 June 2012. Ashley, Walker S., et al. (2004). " Derecho Families". Proceedings of the 22nd Conference on Severe Local Storms, American Meteorological Society, Hyannis, MA. Ashley, Walker S.; Mote, Thomas L.; Bentley, Mace L. (2005). "On the episodic nature of derecho-producing convective systems in the United States". International Journal of Climatology. 25 (14): 1915. Bibcode: 2005IJCli..25.1915A. doi: 10.1002/joc.1229. Bentley, Mace L.; Mote, Thomas L. (1998). "A Climatology of Derecho-Producing Mesoscale Convective Systemsin the Central and Eastern United States, 1986–95. Part I: Temporal and Spatial Distribution". Bulletin of the American Meteorological Society. 79 (11): 2527. Bibcode: 1998BAMS...79.2527B. doi: 10.1175/1520-0477(1998)079<2527:ACODPM>2.0.CO;2. ISSN 1520-0477. Bentley, Mace L.; Mote, Thomas L.; Byrd, Stephen F. (2000). "A synoptic climatology of derecho producing mesoscale convective systems in the North-Central Plains". International Journal of Climatology. 20 (11): 1329. Bibcode: 2000IJCli..20.1329B. doi: 10.1002/1097-0088(200009)20:11<1329::AID-JOC537>3.0.CO;2-F.
Coniglio, Michael C.; Stensrud, David J.; Richman, Michael B. (2004). "An Observational Study of Derecho-Producing Convective Systems". Weather and Forecasting. 19 (2): 320. Bibcode: 2004WtFor..19..320C. doi: 10.1175/1520-0434(2004)019<0320:AOSODC>2.0.CO;2. ISSN 1520-0434. Coniglio, Michael C.; Corfidi, Stephen F.; Kain, John S. (2011). "Environment and Early Evolution of the 8 May 2009 Derecho-Producing Convective System". Monthly Weather Review. 139 (4): 1083. Bibcode: 2011MWRv..139.1083C. doi: 10.1175/2010MWR3413.1. Corfidi, Stephen F.; Corfidi, Sarah J.; Imy, David A.; Logan, Alan L. (2006). "A Preliminary Study of Severe Wind-Producing MCSs in Environments of Limited Moisture". Weather and Forecasting. 21 (5): 715. Bibcode: 2006WtFor..21..715C. doi: 10.1175/WAF947.1. Doswell, Charles A. (1994). "Extreme Convective Windstorms: Current Understanding and Research". In Corominas, Jordi; Georgakakos, Konstantine P (eds.). Report of the Proceedings of the US–Spain Workshop on Natural Hazards (8–11 June 1993, Barcelona, Spain). pp. 44–55. OCLC 41154867. Doswell, Charles A.; Evans, Jeffry S. (2003). "Proximity sounding analysis for derechos and supercells: An assessment of similarities and differences". Atmospheric Research. 67-68: 117–133. Bibcode: 2003AtmRe..67..117D. doi: 10.1016/S0169-8095(03)00047-4. Evans, Jeffry S.; Doswell, Charles A. (2001). "Examination of Derecho Environments Using Proximity Soundings". Weather and Forecasting. 16 (3): 329. Bibcode: 2001WtFor..16..329E. CiteSeerX 10.1.1.627.776. doi: 10.1175/1520-0434(2001)016<0329:EODEUP>2.0.CO;2. ISSN 1520-0434. Johns, Robert H.; Hirt, William D. (1987). "Derechos: Widespread Convectively Induced Windstorms". Weather and Forecasting. 2 (1): 32–49. Bibcode: 1987WtFor...2...32J. doi: 10.1175/1520-0434(1987)002<0032:DWCIW>2.0.CO;2. ISSN 1520-0434. Przybylinski, Ron W. (1995). "The Bow Echo: Observations, Numerical Simulations, and Severe Weather Detection Methods". Weather and Forecasting. 10 (2): 203–218. Bibcode: 1995WtFor..10..203P. doi: 10.1175/1520-0434(1995)010<0203:TBEONS>2.0.CO;2. ISSN 1520-0434.